The Digital Research Library of Illinois History Journal™: A Charles Lindbergh airplane hung at the entrance of the Federal Building in Chicago. 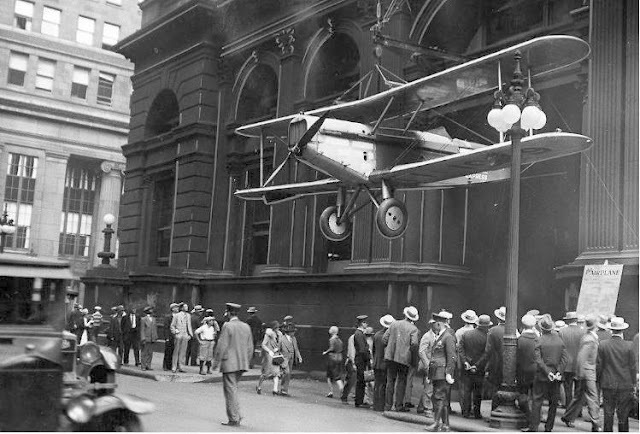 A Charles Lindbergh airplane hung at the entrance of the Federal Building in Chicago. The airplane famed aviator Charles Lindbergh flew before making his legendary Atlantic crossing in the Spirit of St. Louis was hung over the Jackson Blvd. entrance of the Federal Building in Chicago, August 1927.